Gjógvarábáturin, a 10 man boat, is the oldest of the so-called “whaling-boats” (grindabátur). Gjógvarábáturin was build in 1873 by Jóhan í Garði from the island of Nólsoy. The boat, at that time called “Stangabáturin”, was built to Jóan Petur á Stongum, a merchant in Klaksvík, which used the boat to transport goods from Tórshavn to Klaksvík, which was common in those days. On September 8. in 1883 the boat capsized on route between Tórshavn and Klaksvík, and 6 of 7 man crew where lost. 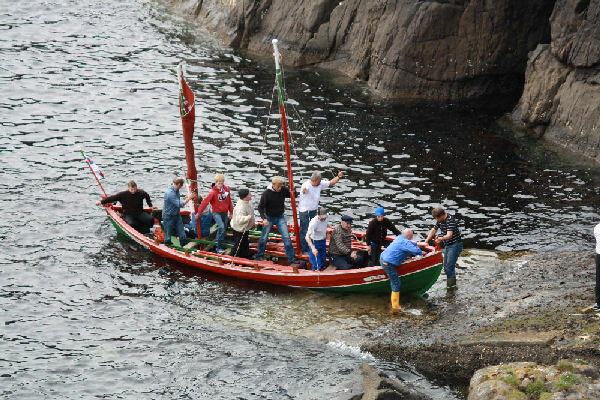 Later the boat was found by the island of Nólsoy and at the St. Olav festival (29. and 30. july) in Tórshavn in 1885 Hans Jacob á Løðhamri from Vágur, bought the boat on auction. The boat did not have any oars. Hans Jacob was a boat builder, and it is said, that he made the oars on one day. But when they should row the boat from Tórshavn to Vágur, he had no crew. So Hans Jacob and two young women rowed the boat the 35 nautical miles from Tórshavn to Vágur. In Vágur the boat was sold to local men. In the beginning the boat was called Nordstjernen (the North star), but later the boat was named Gjógvarábáturin.